BANGI, 9 December 2014 – Universiti Kebangsaan Malaysia (UKM) needed to take the initiative to build bridges between universities and schools as a move to promote it as part of the community in the Malaysian education system. Distinguished Professor Dato’ Dr Shamsul Amri Baharuddin said as Guardian Of The Nation, it needed to carry out efforts to rebuild its image through the UKM Storytelling project. Speaking at the Bicara Persada lecture series on: UKM As The Guardian Of The Nation: An interpretation here today, Prof Shamsul Amri said its students and academic staff should undertake to rebuild its image through the UKM Storytelling project. In addition to UKM being part of the community, he also suggested that students and academic staff be reminded of its history, developments and achievements since its inception. Prof Shamsul Amri said even a renowned research university can go into decline if efforts to maintain its role as a ‘national university’ is not upheld. He contended that UKM had faced such a descent being undermined by its research status. A research-based university should have the mantle of continuing to be the ‘national university’ to arrest the decline. 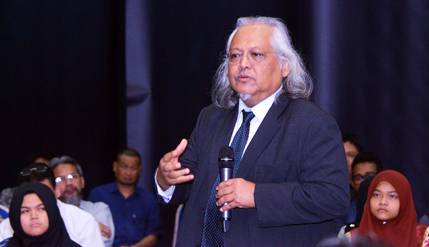 Prof Shamsul Amri, who is the Director of the Institute of Ethnic Studies (KITA), said UKM is special compared to other Higher Educational Institutions (HEIs) as it is the only ‘National University’ in Malaysia. He said UKM is an institution is open to all races in the country as long as they meet the requirements set by the university. National University is defined as a university that uses the national language as the medium of instruction. Thus all research and course work done is towards meeting such a national goal, he said. “The success of UKM in terms of openness to students is shown by not only Malaysians who managed to get into UKM but students from other countries such as Latin America, East, West and others have become part of UKM, even becoming its alumni,” he said. Since entry into the prestigious university is very competitive, it is considered a desirable place to learn. It is also considered as an institution with high scholarship standards. But its role has now changed from being an ‘ivory tower’ to an entrepot, he said. Among those present at the lecture were Vice Chancellor Prof Datuk Dr Noor Azlan Ghazali, Deputy Vice-Chancellors Prof Ir Dr Riza Atiq Abdullah OK Rahmat (Academic and International Affairs), Prof Datin Noor Aziah bt Mohd Awal (Student and Alumni Affairs) and Prof Dr Imran Ho Abdullah (Industry & Community Network).